Discussion in 'Acoustic Instruments' started by Nick Greer, Mar 18, 2008. Okay...I'm not much of an acoustic player, but I've been saving my money up for one and decided to purchase one...This is what I wound up with--a Larrivee D03 Limited Silver Oak. 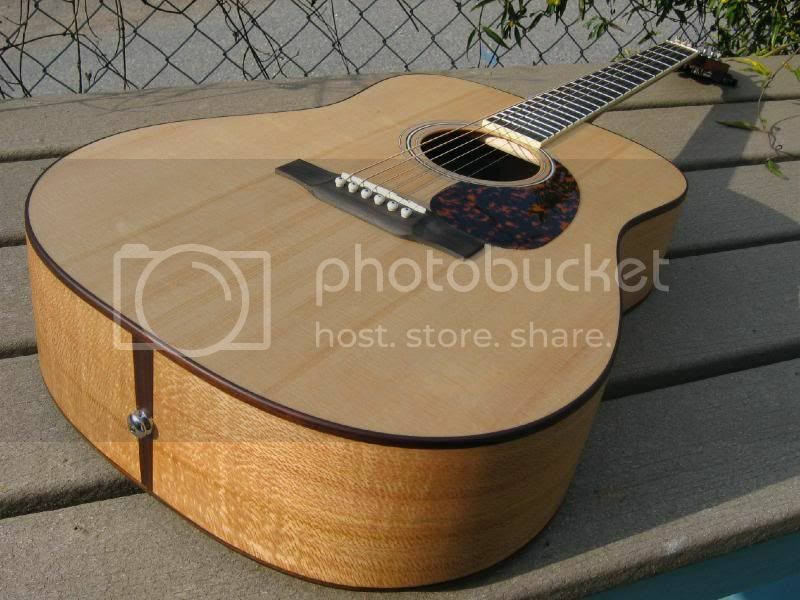 The guitar has a Spruce top, South American Mahogany neck, Rosewood body binding, Ebony fretboard and bridge, Ivoroid neck binding, and Silver Oak back and sides. All of the wood is solid, and I must say that this is one of the best acoustics I've played in a while. I have spent quite a bit of time with Martins, Taylors, a ton of Gibsons, and some other custom built acoustics and I must say that this Larrivee with the Silver Oak back and sides is just plain awesome!!! I own a few acoustics, including a vintage Guild 12 string and a vintage Alvarez Yairi. Just wanted to show this gorgeous piece off and tell everyone to check these out if there are any in your area!!! The store I purchased mine from had the Silver Oak models in the D and L sizes, I chose the D size because it had a more "bold" low end...sounds like many of the vintage acoustics that I've had the benefit of playing in the past! Enough of that--Here are the pics! Very cool! Enjoy it in good health! I own two Larrivees. A D10 with beautiful vine inlays with rosewood back and sides, and a D05 custom with mahogany back and sides, but with the D50 cosmetics (butter bean tuners, squared headstock, and volute on the back of the neck). They both have Sitka Spruce tops, and are incredible instruments. I would take my two acoustics from Larrivee over any Martin, Taylor, or Gibson acoustic that I have played, and they are significantly less $$$ than the comparable models from the above mentioned companies. 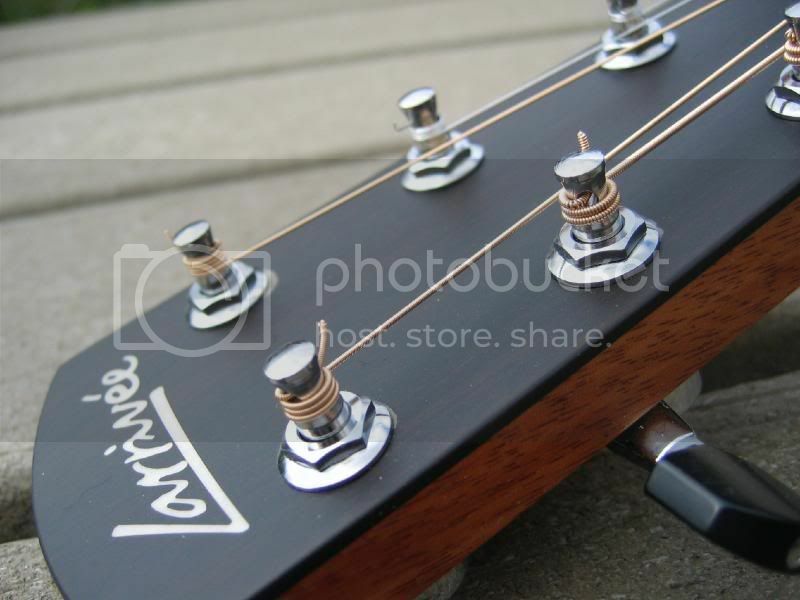 The Larrivee stuff competes with guitars that cost 2X what they charge in my opinion! This seems to be the same thing I hear over and over again about Larrivees...everyone that has one seems to LOVE it...myself included! The only acoustics I currently own.....and the only acoustics I'll ever own. Congrats on a great guitar. Enjoy in good health. 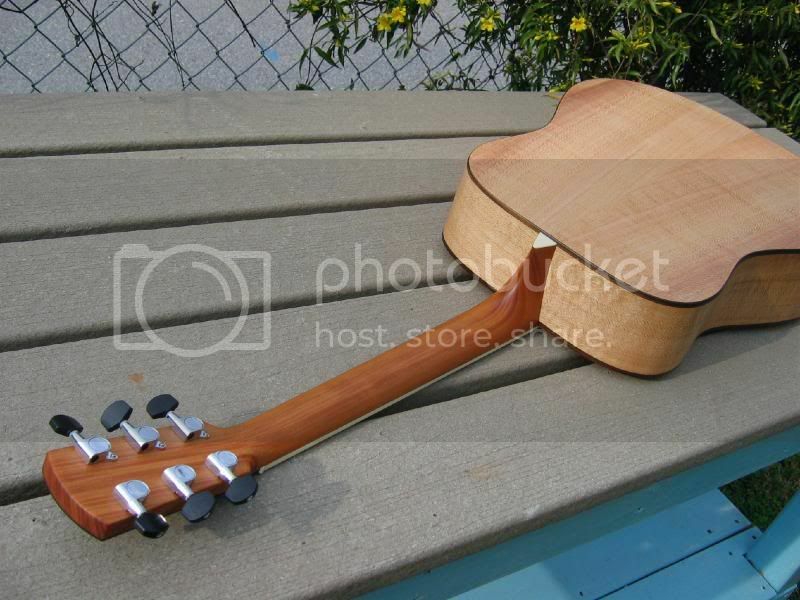 Nice looking guitar. 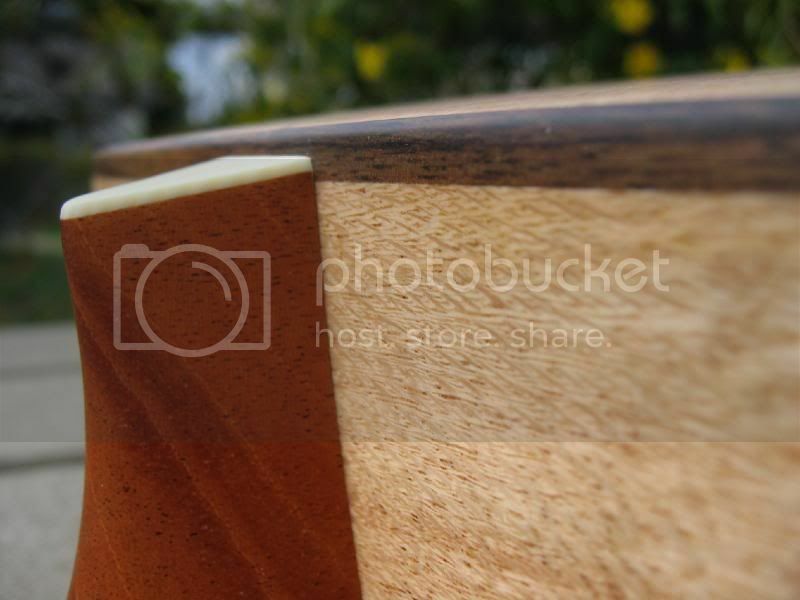 Those guys use great wood and are true craftspeople (men). I have an LV-09e with the onboard Aura. 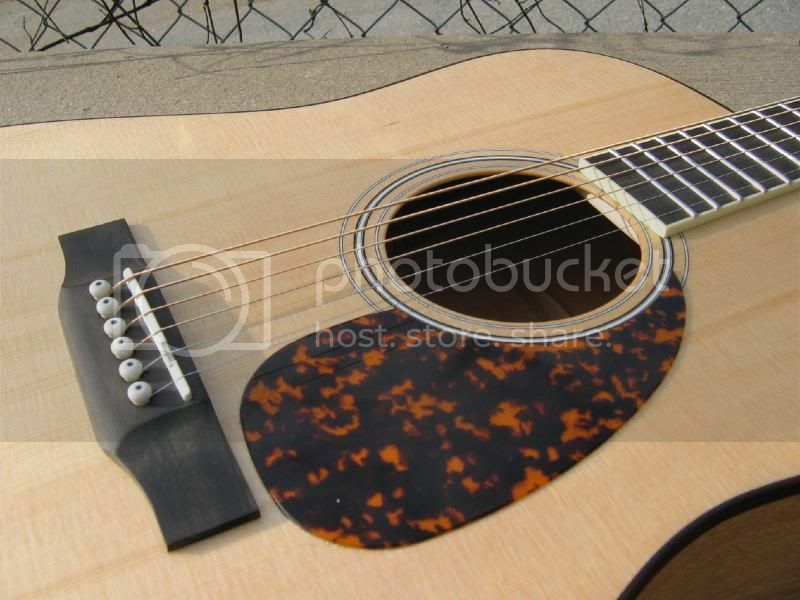 Beautiful neck and fretboard, great construction. This guitar has THE best action I have ever seen on an acoustic. I own three, and I don't think there is a better value out there in acoustic guitars. I have not heard of silver oak...love to try one some day. Larrivees just sound and play great. I agree--I'm not sure there is a better value out there. The Silver Oak has a more "boomy" but tight low end, like a lot of the old pre-war acoustics I've heard/played. I'm not sure if that's a symptom of the wood or not, but I will say that ALL of the Silver Oak Larrivees that I played in the store had this low end, whereas some of the rosewood and mahogany back and side acoustics (even the Larrivees) did not have as much of a pronounced low end. I will also say this--the guitar is NOT DARK...I do not want to leave that impression, it is a very balanced sounding guitar, just with more low end than I was expecting out of a brand new guitar--it sounds like it's been played forever already and I know it will only get better! Very Beautiful! I saw one of those the other day and I was left intrigued... this sounds like a really cool guitar. Hmmmmm..... GAS ATTACKS!!! This guitar is still amazing me--it's such a sweet sounding acoustic...if you can find one at a local dealer, go and play it...I think it will amaze you! Total hijack, but Nick, I played an excellent compressor of yours today at Atlanta Discount - Fish something or other... You did a great job of fattening while preserving the attack. I'm having to think hard on that one and may end up with it. Sweet guitar! My number 1 acoustic is a Larrivee J-09... my Taylor guitars get lonely in the corner. My OM-05 has been getting sweeter and sweeter since I bought her in '94. Great guitars. Enjoy your new beauty! I can't wait for this thing to start sweetening up...though I can't imagine it any sweeter than it is right now!!! This guitar is truly an amazing piece of equipment!!! I thought the same when I got mine, Nick, but I was wrong - they get even better! Nick - sweet geetar! I too, have become a Larrivee believer since I purchased my L-05 a year ago. If you ever get together some soundclips of the silver oak, let me know - I am curious to hear it! I have a ten or so year old D-03R. Probably the first year of production. Let me tell ya, as sweet as it was the day I bought it, it has indeed become even sweeter. Someone would have to prove it to me to believe there is a better sub 1k acoustic out there.